CUSTOMERS SAY: "Best Satoshi Artwork Ever!" "Def does Nakamoto justice" "Brilliant Piece!" "Thanks!" "Framed on my office wall, right by my miner. Love when people ask, 'Who is Satoshi Nakamoto?'" "I bought and framed this for my business partner and he LOVES it almost as much as he loves his Bitcoin!" "CoinedBits nailed Satoshi Nakamoto. Best I've ever seen!". "Heck Yes Satoshi is the Man of the Century!" Looking for the perfect gift for someone who loves Bitcoin? Look no further as this CoinedBitsÂ® collector's piece is sure to please any cryptocurrency fan. Printed on top of the line 100lb glossy weight paper, this sturdy full color magazine cover shines. 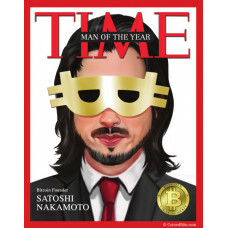 You can proudly display your Time Magazine Satoshi Cover with or without a frame. Sized at 8.5""x11'', it fits perfectly in a standard 8.5''x11'' frame. Your purchase will be shipped next business day in a card stock envelope to ensure it arrives in prime condition. Proudly display your Bitcoin fervor at home, the office or paste 'em all over public places to help spread the Bitcoin Revolution! All CoinedBits® products are backed by our 100% Customer Satisfaction Guarantee. Buy now and start enjoying your Satoshi Nakamoto collector's piece today! "The Man Behind the Mask--powerfully portrayed--semi-revealed. So glad I found this awesome piece. Long Live Bitcoin!"